Some of the doomed white oaks in the planned Pheasant Run subdivision as they looked in February. All of the North Albany residents who spoke were against it, but the city council Wednesday approved the Pheasant Run subdivision anyway. It didn’t have much choice, given that the planning staff had recommended approval on the grounds the development met all applicable criteria in Albany’s development code. Hayden Homes wants to build 147 houses on part of the 47-acre field north of Dover Street and east of Crocker Lane. About 13 acres would be left natural. While some trees would be cut, several hundred would be planted along the new streets and on the lots. Much of the testimony — as far as I could hear it, which wasn’t all that far — dealt with eight big white oaks on the property. They are said to be 150-250 years old. The subdivision layout calls for six to be cut down and two to be saved. The opponents also were concerned about the loss of wildlife habitat on the acreage, and about yet another increase in traffic when this added housing it built. 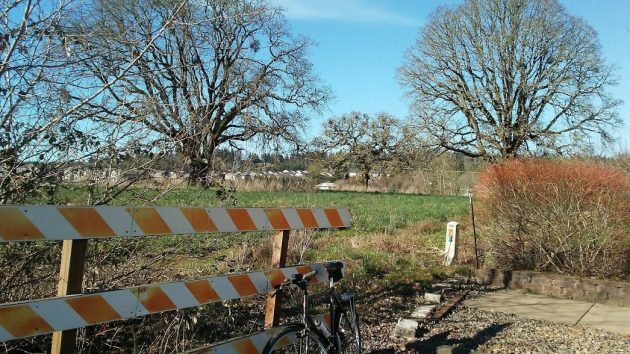 The Portland lawyer for the applicant told the council that under state law and the city’s development standards, the council was obligated to approve the subdivision. City Attorney Sean Kidd agreed. The implication was that if the council said no, the case would go to the Land Use Board of Appeals and the city would lose. It can be done. I live in part of an apartment complex made of small, oddly arranged, poorly designed, single-story buildings surrounded by large oaks and other old trees, a place I like very much. But it was built in the 1960’s before things changed, partly for better, and partly for worse in ways I can’t quite pin down. It may all relate to computer-aided optimization of business, where massive amounts of data are churned to maximize profit (or perhaps to make any at all). There are reasonable inputs like labor and material costs, legal constraints, and selling price. But then the computation decides on things like public relations, manipulative and deceptive advertising, political contributions and machinations, etc. The end result in the case of housing construction is that every project looks alike, and a place nobody really cares about. * I’m not saying any of this is new, just that it’s been turned with great efficiency into compulsory Science. In any case, half of this project’s land will be turned into hot, stinking, impervious asphalt because alternatives to our dominant car-very-near-every-home layout seem unthinkable. Without that, most of the trees could survive. *Thanks to James Howard Kunstler for the idea of “places people care about.” He’s mostly right about urban design issues, but he’s gradually being proven wrong about civilization ending by running out of energy. I tend to agree, Hasso. I grew up around trees, my parents having had several, including two massive black walnuts in our yard. I would go on to master them, able to climb to almost the top, disappearing in the thick canopy while trying to pelt my unsuspecting dad with walnuts. “Get down from there before you break a leg!” he would yell, not knowing exactly where I was hiding. But why the developer couldn’t work around these beauties is unfortunate. He not only would have scored some points but would have left it more aesthetically pleasing. Welcome to the real world North Albanians. Developers have filled the immediate Albany area to it’s limits for multi-story tenement housing. So it’s now your turn with all that open land to have your share. Too bad about the trees. Newer ones can be planted. Just curious, James. I don’t live in N. Albany. Do you think there’s a city of “North Albany” in the future? Let’s see. 147 more homes. Times 2.5 cars per equals an additional 367.5 autos clogging up the immediate area. Give or take 20. Since our council clearly caved to the threat of LUBA loss, it is high time to start allocating funds to buy up land (private property) around Gibson and Crocker for that round-a-bout. This is not a reply but a heads up. They have been working overtime on the Riverside Drive street widening/bike lane project as you reported on a few weeks ago. 80 foot gravel trucks have been going by about every 5 minutes for days (but not today). 2 flaggers sections of 10 minutes wait each. Lots of activity! The reroute around the 90 degree curve has been completed and paving is underway. If you get in the way on your bike you will be killed, so please be careful. Is there any way to get them so STOP allowing subdivisions? This is getting crazy! Lots are so small no one even has a yard anymore and you can see in your neighbor’s house. I am so over all these new subdivisions and apartments…. Really makes of what used to be so nice in North Albany. I totally agree with the size of lots the new homes are being built on! Barely a yard and roofs almost touch on the sides. They aren’t good quality so you know they aren’t sound-proofed to hear your neighbors noise. So sad that quantity is more important than quality and true livability. Assuming children in future will be entertained by electronics instead of neighborhood parks. There used to be an ordinance, I think, requiring land be given by developer for a park in each new housing unit. It hasn’t been used in 15 years! The last one was “Doug Killin Friendship Park” off 53rd and a lot more subs have been built since then in all parts of Albany. Wake up and gets parks in the projects please! No one seems to be too upset about all the ‘ancient” oak trees being cut down around the old McFarland School. Would these be the same idiots that are also responsible for the hidious/unattractive, unwanted, un-needed mess downtown that serves just a few businesses w/o bothering to address the status of the surrounding streets and sidewalks?? I daresay you have an extremely dystopian view of the major improvements that have been happening (and are still & will be ongoing) in the CARA district, but that’s your P.O.V. I gladly & proudly wear the mantle of being one of the “same idiots” you so describe. You want to improve more residential streets? As a minimal start, vote YES for the minimal 5-cent gas tax! Vote NO on the gas tax. Let CARA pay to fix up the streets in their district. Just takes a vote at a council meeting to approve that. Yes, you are one of the aforementioned idiots (mild word, really) on the council. You know what you can do with your words and acronyms…such as dystopian and POV. More traffic in N. Albany!! Just what we don’t need. And it does not matter how many streets the developers will add or include on that property it will not help the congested N. Albany Road, Springhill Dr. and Hwy 20. Trying to merge onto those roads will be even more difficult with longer lines of traffic to wait in. It is sad and disheartening too see all those big trees go. I don’t have a problem with the houses going in..just don’t want cluster houses surrounding me. Keep the lots the same size as ours and keeping the trees would have been ideal. And the traffic is going to be horrible in an already congested traffic area. Developer doesn’t care and city caved due to greediness.